Adam Whitney Savage (born July 15, 1967) is an American special effects designer/fabricator, actor, educator, and television personality, known as the former co-host (with Jamie Hyneman) of the Discovery Channel television series MythBusters and Unchained Reaction. His model work has appeared in major films, including Star Wars: Episode II – Attack of the Clones and The Matrix Reloaded. He is a prominent member of the skeptic community. He lives in San Francisco with his twin sons and his wife, Julia. Born in New York City, Savage was raised in Sleepy Hollow in Westchester County, New York. He graduated from Sleepy Hollow High School in 1985. His grandfather, Cushman Haagensen, was a surgeon who pioneered in breast cancer surgery. His father, Whitney Lee Savage (1928–1998), was a painter, filmmaker and animator known for his work on Sesame Street, and has a permanent exhibit in the Avampato Discovery Museum in Charleston, West Virginia. Whitney Lee was also known for directing the 1968 underground short film Mickey Mouse in Vietnam. His mother, Karen, is a psychotherapist. He was the second youngest of six children, with the four older children coming from his parents' previous marriages. He has two older brothers, two older sisters and one younger sister. His sister Kate Savage is also an artist. As a teenager in Sleepy Hollow, he routinely visited the local bike shop to have flat tires fixed. The shop showed him how to do the repairs himself. From this experience, Savage said, "I realized you could take a bike apart and put it back together and it wasn't that hard...I've been building and putting bicycles together since then." Savage began acting as a child, and has had five years of acting school. His early credits include voicing animated characters that his father produced for Sesame Street, Mr. Whipple's stock boy "Jimmy" in a Charmin commercial, a helper in the special effects of Star Wars, and a drowning young man saved by a lifeguard in the 1985 Billy Joel music video "You're Only Human (Second Wind)". Describing the early abandonment of his acting career, Savage said that "by the time I was, I guess probably nineteen, I had passed on that in favor of doing stuff with my hands – graphic design, assistant animation in New York, and then eventually working in theater in San Francisco, and film special effects. Then MythBusters came along and it was the perfect marriage of two things, performance and special effects." On November 25, 2011, Savage received an honorary doctorate from the University of Twente (Enschede, Netherlands) for his role in the popularization of science and technology. Savage has worked as an animator, graphic designer, carpenter, projectionist, film developer, television presenter, set designer, toy designer, and gallery owner. He worked as a model maker on the films Galaxy Quest, Bicentennial Man, Star Wars: Episode II – Attack of the Clones, The Matrix Reloaded, and Space Cowboys, among others. Savage played the role of a helpful engineer in the 2001 film Ever Since the World Ended and the role of an army surplus store owner who sells a man a rocket engine for his pickup truck in 2006 in The Darwin Awards, which also featured MythBusters co-star Jamie Hyneman. He made a cameo appearance with Hyneman on CSI: Crime Scene Investigation on the May 1, 2008, episode "The Theory of Everything." In the "making of" material for The Matrix Revolutions, he appears in his role as a special effects artist and discusses some of the miniature effects used and the difficulties involved. He previously taught advanced model making in the department of Industrial Design at the Academy of Art University in San Francisco. Savage has become a regular presenter at magician James Randi's annual skeptics' conference, The Amaz!ng Meeting, since first appearing in January 2006. Savage credits his introduction to the skeptical community to Michael Shermer, who interviewed him for Skeptic Magazine. He also appeared in the UK, giving a talk at the first Amazing Meeting London from October 3–4, 2009, hosted at the Mermaid Conference Centre, Blackfriars. Savage was a featured performer at the three w00tstock v1.x shows in 2009, and appeared in four w00tstock v2.x shows in 2010. He also appeared as a guest on Diggnation's 220th show. Savage has also been a regular guest speaker at the annual Maker Faire since 2008, speaking on different topics such as his obsession with the dodo bird and problem solving, and also taking questions from the audience members about the MythBusters and other things. Savage hosted an episode of the Discovery Channel series Curiosity, in which he speculated as to whether or not it is possible for humans to live forever. During the program various topics such as limb regeneration, organ printers, and even age reversal are discussed. In 2011, Savage appeared as "Dan" in a short film directed by Frank Ippolito titled Night of the Little Dead. Savage and Hyneman are judges on the game show Unchained Reaction which premiered in March 2012. Savage is an occasional guest host for lecture events at the San Francisco-based non-profit City Arts & Lectures, and delivered a keynote address at South by Southwest (SXSW) Interactive Festival on March 10, 2014. On May 18, 2012, Savage was the commencement speaker at Sarah Lawrence College. Savage is a co-host on the weekly podcast Still Untitled: The Adam Savage Project. The project launched on June 5, 2012, and is in the format of a conversation between Savage, Will Smith, Norman Chan, and Simone Giertz about topics from science and movies to making and work ethic. Episodes typically last 30–45 minutes. Savage is currently an editor and contributor at Tested.com. In 2017, Savage toured with Michael Stevens on the Brain Candy LIVE! tour. In June 2017 Savage was named Humanist of the Year by the American Humanist Association at their annual Conference. October 2017, Savage played a cameo as a shopkeeper merchant in the Blade Runner 2049 short film prequel, 2048: Nowhere to Run. In April 2018, Discovery announced that Savage will host and produce a new series called MythBusters Jr, a series focused on a group of young scientists tasked with completing various experiments of challenges through the use of STEAM skills. In July 2018, Savage in a collaboration with Weta Workshop created and acted in the shortfilm A Farewell To Arms. Savage's role in the show is to (with his co-hosts) disprove ("bust") or confirm myths through testing and experiments done at different scales. If the myth is about a one-time occurrence, or if a myth requires extremely specific circumstances to occur as stated, it is often deemed "plausible" instead. Savage's demeanour on MythBusters is animated and energetic, providing a foil to Jamie Hyneman's more reserved straight-man persona. Savage and Hyneman were the sole hosts of the show for the first season of MythBusters. Starting with the second season, members of Hyneman's staff were introduced and began to appear regularly in episodes; Kari Byron, Tory Belleci and welder Scottie Chapman appeared in the second season. In the third season, Chapman was replaced by Grant Imahara, a robot builder and model maker. In an interview Savage gave during The Amaz!ng Meeting 5, he expressed an interest in proving natural selection over creationism on MythBusters. 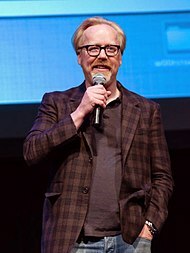 However, in 2008, Savage conceded that such an episode is unlikely because MythBusters has a policy against trying to disprove supernatural phenomena. Savage and his wife Julia Ward were married on September 11, 2004. He has twin sons from a previous relationship. Savage is an atheist. He wears a hearing aid on his left ear due to the congenital condition otosclerosis. He is also a practiced juggler as seen on MythBusters. Savage endorsed Senator Bernie Sanders for President in the 2016 U.S. presidential election. Savage has a lifelong interest in costume making and cosplay. He said, "I remember my mom getting me a 'Jaws' costume when 'Jaws' came out...and wearing a Batman costume. Back then, everyone dressed up as hobos." He strives for authenticity with his costumes. While in high school, he and his father made a suit of armor out of aluminium roof flashing that had 700 rivets. He said, "I wore it to school and passed out from heat exhaustion in math class. I woke up in the nurse's office and the first thing I said was 'Where's my armor?'" In 2011, he built a costume based on the character No-Face from the film Spirited Away. ^ a b c d Adam Savage (August 20, 2008). "Skeptics' Guide to the Universe #215 with guest Adam Savage" (MP3). The Skeptics Guide to the Universe (Interview). Interviewed by Steve Novella; Bob Novella; Rebecca Watson; Evan Bernstein. Archived from the original on December 19, 2008. Retrieved November 18, 2008. ^ Chase's calendar of events 2009. McGraw-Hill Professional. 2009. p. 363. ISBN 978-0-07-159956-6. ^ "Bio-Adam Savage 2008" (PDF). Symantec. Archived from the original (.PDF) on June 27, 2008. Retrieved June 21, 2008. ^ a b c Kramer, Peter D. (October 29, 2011). "Reminiscing with Sleepy Hollow 'Mythbuster' Adam Savage". The Journal News. Journal News Media Group. pp. B1–B2. Archived from the original on January 22, 2012. Retrieved December 15, 2011. ^ "Artist Profile: W. Lee Savage (1928-1998)" (PDF). Retrieved May 17, 2011. ^ Doctorow, Cory (June 23, 2013). "Mickey Mouse in Vietnam". Boing Boing. Retrieved June 1, 2016. ^ "Adam Savage on Twitter". Twitter. Retrieved April 22, 2016. ^ "Adam Savage, Co-Host". The Discovery Channel. Archived from the original on September 13, 2008. Retrieved September 20, 2008. ^ Dwyer, John Stephen (May 5, 2010). "The men behind the MythBusters". Blast Magazine. Archived from the original on November 4, 2010. Retrieved October 1, 2010. ^ "Ever Since the World Ended (2001)". The Internet Movie Database. 2008. Retrieved September 18, 2008. ^ "The Darwin Awards". The Internet Movie Database. 2008. Retrieved September 18, 2008. ^ Wagg, Jeff (February 4, 2008). "The Amaz!ng Meeting 6". James Randi Educational Foundation. Archived from the original on July 10, 2009. Retrieved October 1, 2010. ^ "Skepticality". Skeptic Magazine. Retrieved September 6, 2014. ^ "Amazing Meeting London (2009)". Speakers at Amazing Meeting London. 2009. Archived from the original on April 3, 2009. Retrieved March 28, 2009. ^ Hibberd, James (January 20, 2012). "'MythBusters' hosts launching new show". Entertainment Weekly. Retrieved January 20, 2012. ^ "Adam Savage & John Hodgman - City Arts & Lectures". ^ "Adam Savage to Keynote SXSW Interactive on Monday, March 10". South by Southwest 2016 Music, Film and Interactive Festivals - Austin Texas. ^ "84th Commencement: May 18, 2012". Sarah Lawrence College. May 2012. ^ "Adam Savage, Commencement Keynote Address". Sarah Lawrence College. Retrieved August 26, 2013. ^ "Still Untitled: The Adam Savage Project". iTunes. ^ "Viral Video: MythBusters' "Tested"". Archived from the original on December 8, 2015. Retrieved November 10, 2015. ^ "Unleashing a Myth Buster: Q&A with Adam Savage". FLY. Archived from the original on May 24, 2015. ^ "Adam Savage Talks up New Science Tour BRAIN CANDY LIVE!". Nerdist.com. ^ Tupponce, Joan. "Curious minds come together for 'Brain Candy Live' in Richmond on Feb. 22". ^ "Building Humanism, Busting Myth and Privilege". The Humanist.com. The American Humanist Association. Archived from the original on January 22, 2018. Retrieved January 22, 2018. ^ France, Lisa Respers (April 12, 2018). "Adam Savage is returning with a 'MythBusters' series for kids". CNN. Retrieved May 2, 2018. ^ Burton, Bonnie (April 10, 2018). "Adam Savage to host new show, MythBusters Jr". CNET. Retrieved May 2, 2018. ^ Strauss, Gary (January 15, 2008). "'MythBusters' is the stuff of legends, tall tales". USA Today. p. 1. Retrieved February 14, 2010. ^ Chan, Norman (September 12, 2018). "Unlicensed Art - Still Untitled: The Adam Savage Project - 9/12/18". Tested. Retrieved September 12, 2018. ^ Purdy, Kevin (May 30, 2009). "MythBusters' Adam Savage Talks Tech, Obsessions, and Science". Lifehacker. Archived from the original on June 15, 2009. Retrieved July 4, 2009. ^ Savage, Adam (April 18, 2010). Food for The Eagle (Speech). Boing Boing. Retrieved October 1, 2010. ^ In a 2011 interview on Kevin Pollak's Chat Show, at 1:20:00, Adam Savage is quoted as saying "Both Jamie and I are atheists." ^ Savage, Adam (May 4, 2009). "Adam Savage: @jayyoozee Yes I wear a he ..." Adam Savage Twitter. Retrieved October 1, 2010. ^ "Adam Savage IAmA". Reddit. 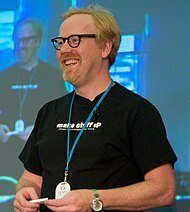 Wikimedia Commons has media related to Adam Savage.